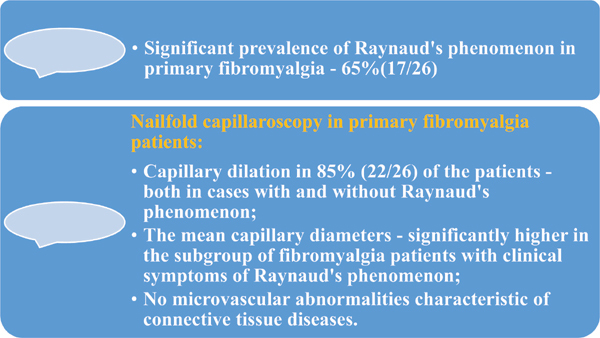 Introduction: Although Raynaud's Phenomenon (RP) is observed in a significant proportion of patients with primary fibromyalgia, the available data on capillaroscopic findings in primary fibromyalgia are scarce. Objective: The purpose of the study was to assess the capillaroscopic pattern in patients with primary fibromyalgia. Patients and Methods: 26 patients with primary fibromyalgia (25 women and 1 man) were included in the study. Mean age was 55±10 years. As control groups were examined 31 patients with primary RP and 35 healthy volunteers. Capillaroscopic examination was performed with a videocapillaroscope Videocap 3.0 (DS Medica), magnification 200x with analysis of the main capillaroscopic parameters as follows: capillary distribution, shape, mean capillary diameters and length, mean capillary density, visibility of the subpapillary plexus; presence of avascular areas, microhaemorrhages and neoangiogenic capillaries. Results: Symptoms of RP were observed in 65% (17/26) of the cases with primary fibromyalgia. At capillaroscopic examination, the most frequent finding in patients with primary fibromyalgia was the presence of capillary dilation in 85% (22/26) of the patients - both in cases with and without RP. However, the mean arterial and venous capillary diameters were significantly higher in the subgroup of fibromyalgia patients with clinical symptoms of RP. Of note, microvascular abnormalities characteristic of connective tissue diseases could not be observed in primary fibromyalgia patients. Analogous changes - presence of dilated capillaries - were found in 96.6% (29/30) of patients with primary RP. Conclusion: In our study, the most frequent capillaroscopic finding in patients with primary fibromyalgia was the presence of dilated capillary loops analogous to primary RP. Capillaroscopic signs suggestive of connective tissue disease could not be found in primary fibromyalgia patients. Keywords: Nailfold capillaroscopy, primary fibromyalgia, primary Raynaud’s phenomenon, dilated capillaries, connective tissue, patients. Keywords:Nailfold capillaroscopy, primary fibromyalgia, primary Raynaud’s phenomenon, dilated capillaries, connective tissue, patients. Abstract:Introduction: Although Raynaud's Phenomenon (RP) is observed in a significant proportion of patients with primary fibromyalgia, the available data on capillaroscopic findings in primary fibromyalgia are scarce.